A lot on the road? But not without your watches! When travelling, you don't want to do without the right watch for your outfit and occasion. But the valuable pieces can quickly be damaged during transport. That does not have to be! 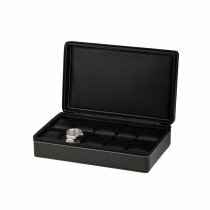 Your watches are safely stowed away in a watch case and survive every journey undamaged. But also at home your wristwatches are in good hands in a watch box. If you have particularly large wristwatches in your collection, make sure you have enough space when you buy your new watch case. In our assortment you will surely find a suitable case in the desired shape and color for your watches. Click your way through! watch boxes or winder for automatic watches for Timesho24. Do you have any further questions or would you like advice? We are to you by E-Mail, Contact form or telephone gladly at the disposal. Contact us!